Collaborative Law, Collaborative Practice, Collaborative Process, and Collaborative Divorce are terms often used to mean the same thing. 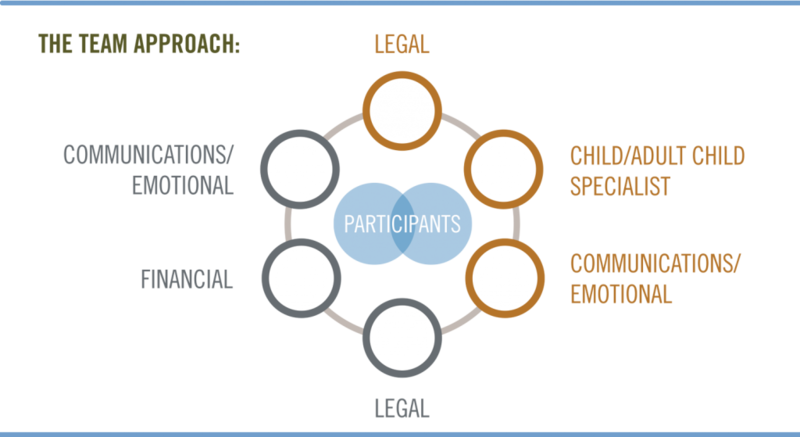 The Collaborative Approach can be applied to resolve a wide range of legal disputes, where the participants would like to preserve relationships and avoid the typically higher costs of litigation. “Collaborative Divorce” refers to a team approach to the resolution of family law disputes (e.g. divorce, custody and domestic partnerships). Pasadena Collaborative Divorce specializes in the Collaborative legal resolution of divorce-related disputes. “Civil Collaborative Practice” employs the same non-adversarial, team approach to civil disputes, including business, real property, employment law, construction law, intellectual property, as well as wills and trusts. Wills, Trust & Estates matters, generally referred to as “Probate Law,” greatly benefit from the Collaborative Team Approach by preserving family relationships. Pasadena Collaborative Divorce is a “practice group” of collaboratively-trained professionals, including Financial Specialists, Attorneys and Mental Health Professionals. All California Collaborative Practice groups are members of Collaborative Practice California, and are committed to the Collaborative Process: a team approach for solving problems by reaching mutually agreeable solutions. Clients and their team of professionals work together respectfully to reach mutually satisfying agreements. The goal is a win/win resolution for all participants. Clients are supported to select their team. All collaborative practitioners [who] are trained in both collaborative practice and mediation. Typically clients and the different professionals meet together as needed, using established protocols that guide information gathering, effective communication, making interim agreements, and resolving issues. Information gathered is shared with clients and the professional team to clarify each client’s interests, and to generate win-win options for possible solutions. All communications made during the Collaborative Process remain private to the professionals and clients, and may not be used as evidence in court if clients later decide to litigate. The guiding principles of Collaborative Process remain the same, regardless of the area of law to which they are applied. Clients and Collaborative Professionals agree at the outset to settle the case, instead of fighting in court. If the case is not settled, all professionals must withdraw and attorneys then assist clients with finding new attorneys to begin a traditional litigated court process. [Even i] If clients shift to litigation, they have nevertheless laid some groundwork for more effective ways to work together, even if they have to resolve their differences in court. The main goal of Collaborative Practice: An agreement which considers the needs and interests of all clients. The Collaborative Method of handling conflict aims to minimize hostility, reduce unnecessary stress and costs, and enhance communication skills to allow participants the possibility of a respectful and cordial relationship going forward. Review our biosand call any PCD professional to get started. Ask for and receive a FREE 30-minute phone consultation, per family, to discuss different divorce process options. Or, attend one of our FREE Divorce Options Workshops.